Pelican Products cases are virtually indestructable and watertight for the ultimate protection of valuable equipment. Pelican cases are highly durable watertight polymer cases. These cases have been used from the top of Mount Mckinley to war zones to elite sports fishing events. All of our Pelican products are backed by an unconditional Lifetime Guarantee. Please allow 2-3 weeks for Pelican Cases ordered in colors (except black). 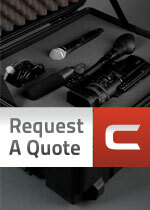 Ask Us How We Can Customize Foam for Your Pelican Case!